1. Jenny the Garden Cat continues to be ridiculously photogenic. She even has admirers visiting her in the garden, and sending her gifts! Exactly as it should be. 2. I saw Shae today, when she dropped by for lunch. She's looking good actually, the fur is growing back. So it looks like it was mostly a spring thing, maybe fleas and/or pollen. I wish I could get her a good flea preventive in pill form but that requires a vet visit. You'd think they could have different rules for ferals. I'm planning on building a drop trap, which apparently is the only real way to capture a reluctant kitteh. My beautiful Leia. This was from our townhome in NC. She spent quite a bit of time guarding the stairs for some reason. That is a lovely photo of Leia. We have also had lovely weather today, sunny and blue skies, but a very cold northerly wind. I hope you have success building your trap and catching Shae. Oh I wish the best in catching your little girly girl. SO glad she is feeling better. And looking better. Leia, you were just wanting and succeeding in being alluring. 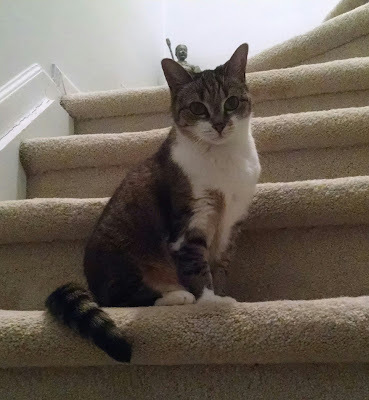 Leia...what a beautiful Stair Mistress you were too and such a professional pose. Purrfect placement of your precious paws and your lovely lady tail gracefully draped. Good luck with the trap project. PS I love your random thoughts and am so glad you are continuing to blog. Aww, it was nice seeing Leia today! That is good news about Shae - I hope you are able to catch her with the drop trap. We’re glad you’re looking out for Shae and we hope you can catch her. Love seeing Leia today...what a pretty girl. That is a beautiful photo of Leia. I agree, there should be different rules for ferals so they can get meds they need. Leia is looking gorgeous on the stairs there! It’s great news Shae’s fur is growing back! You are so wonderful to look after her. I was confused when I went to see 'Jenny' and got a FB page for Joey! But, I figured it out! Jenny is adorbs, as is that photo of Angel Leia. Unfortunately, as often as I've tried to beg a vet to 'treat' a feral cat without bringing it into the office, I've gotten a NO! every time! I have friends who have stashes of medicines, who've helped me in the past, with my friendly ferals, but time stands still of no one. Thankfully, both Sweetie and The PO'M are now so used to being trapped by my drop trap, that they don't freak out anymore! Good luck! Beautiful, beautiful Leia. Thanks for looking after Shae. Such a beautiful, beautiful girl!! !